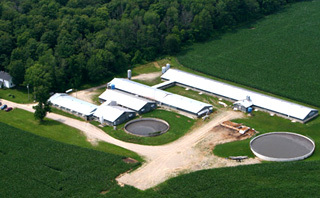 An extremely worthy & suitable product for dairy, and poultry liquid manure, where Penergetic-g acts as a catalyst to naturally create an aerobic condition in the slurry, activating beneficial microbes which transform the slurry into a nutrient rich organic fertilizer – which is far more beneficial than the more commonly occurring and problematic untreated (anaerobic) manure or slurry. Penergetic g is an economical, easy to apply manure treatment method (requiring no capital equipment) used by thousands of dairy farms in Europe and around the world. Mixpenergetic g with plenty of water in a watering can and pour evenly over the channel or through slatted flooring. Best results may be achieved by pouring 2/3rds of the recommended dosage at the head of the channel. In barns with automatically scrappers, the scrappers will carry the penergetic g/water mix out with the slurry to the pit or tank. Poke two holes through the floating layer for each square metre of crust and pour the mixture of penergetic g and water through these holes into the liquid layer of the slurry. For best results at the outset, pour the penergetic g/water mixture over the stirring mechanism (agitator) while operational. If no agitator is available, puncture any floating layer present with a suction hose and introduce the penergetic g/water mixture through the hose. Pump sufficient slurry out of the tank or lagoon to fill the suction tank then pump it back into the slurry tank/lagoon. The idea is the get the penergetic g/water mixture integrated into the slurry as much as possible at the outset so as to ensure good results more quickly. In the case of large slurry tanks or lagoons, especially if a thick crust is present at the outset (dairy) or heavy sediment layer (hog), this procedure should be repeated at several locations around the structure. Mix penergetic g with plenty of water in a watering can and pour it evenly over the empty pit or channel. Repeat this procedure each time the channel or pit is drained. On an on-going basis, to treat manure that continues to be generated, penergetic g mixed with plenty of water is applied through the slatted flooring or into the manure alleys in the barn. This maintenance application should be carried out regularly, usually weekly, but at least every 14 days.